The architectural survey speculates that "this curiously narrow building.... of considerable artistic and social significance", was, in the 1840's, an in-fill development replacing a carriage arch which gave access to coach houses behind adjoining properties. Whatever its origins, this is certainly one of the oldest shopfronts in the town. 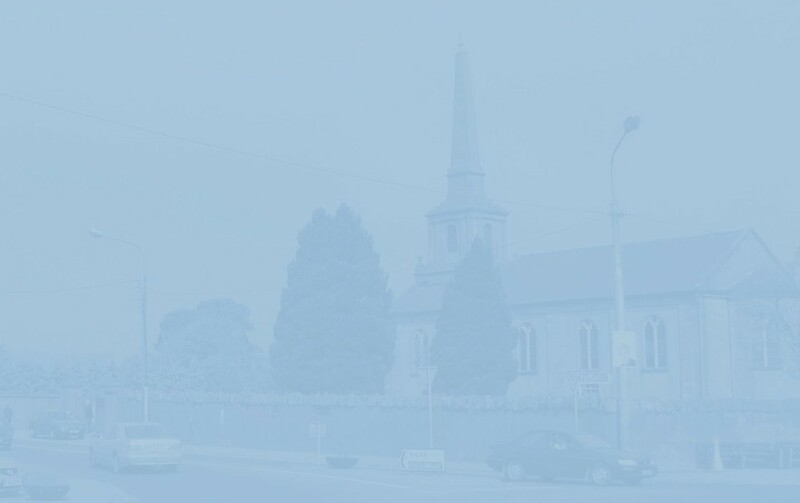 Joseph Dowling was the lessee in the 1850's, succeeded by Michael, Nicholas (listed in local directories of 1870, 1881 and 1894), Mark and Catherine Walsh1. In 1901, Kilkenny-born Nicholas was a butcher and cattle-dealer, assisted here by another Kilkennyman, Richard Brett. A decade later, the widowed Catherine Walsh was listed as a victualler, farmer and Head of Family. The census also names her children, Joseph and Margaret, plus two servants; Lizzie Hennessy, a domestic servant and Maryanne Hennessy, a seamstress. In the 1920's, Edward Kingston had a grocery shop here. 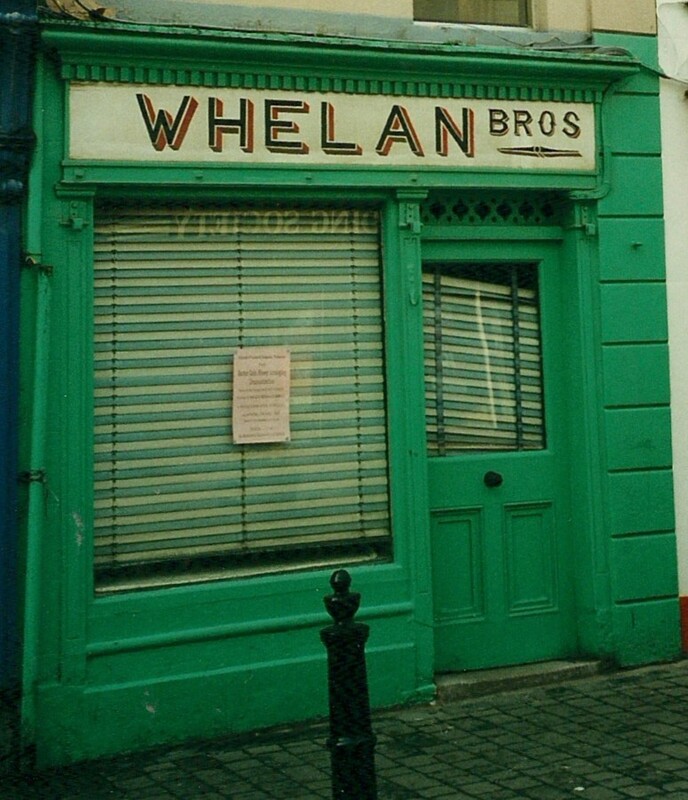 He later relocated across the street (to where the EBS offices are today), and was replaced by Patrick Whelan, and then Denis and Joseph Noonan, a butcher from Cashel, County Tipperary. The next names in the Cancellation Books are William Larkin and Michael McHugh, followed, in the early 1940's, by another butcher, Mick, universally known as 'Mockler'2 Whelan from Kilmurray, The Heath. His brothers Paddy and Jack were involved in providing the meat - Wether Mutton on their billhead from that decade has a curiously archaic ring about it - but Mockler was the man behind the counter. Number 71 is especially remembered by many pupils from the Heath area who, on their lunch break from the town's secondary schools, were always assured of soup and a sandwich here by Mick's sister, Eileen. Since his retirement in the 1980's, this quaint little shop has remained vacant. At one stage, Mick also owned a public house, The Wheel Inn3, on the old Dublin Road at The Heath. 'Mockler', a dedicated Bingo-player and well-known figure around the town, died in May 2015, aged 100. In July 2017 a solicitor's office opened here. The original traditional shopfront in the picture above was retained behind the new one. 1 Mark Walsh, Justice of the Peace and Chairman of the Town Comission, built Nutgrove House which was eventully acquired by the Aird family. He died in 1908 aged 61, and his wife Catherine in 1952, aged 88. One of their daughters, May, studied music in The Conservatoire de Paris where she became friendly with a woman whose husband was a governor in the French Protectorate of Tunisia. While visiting them in 1905, May, aged only 19, died from Blackwater fever - a complication of malaria - and was interred there. After surviving World War I, one of Mark and Catherine's sons, Nicholas, went missing in South Africa and was never found; another son, Joseph, married May Aird thus establishing the Walsh/Aird connection. Today Nutgrove is the home of farmer/politician Wilie Aird and his wife Ann Marie. 3 Previously owned by the Barry and Poole families and, before them - when known as 'The Thatch' - by the Meehan family already discussed in the entry for Nos. 94 & 95, Main Street. Meehan's second premises on The Heath (subsequently Dunne's and Treacy's) near the present-day school, was called 'The Slate'.